I’ve been an avid gardener for more than a decade, but doing the research for Growing Berries and Fruit Trees in the Pacific Northwest turned me into a bona fide berry pusher. I’m now the one giving blueberry bushes as housewarming gifts to friends who have recently bought homes, convincing parents of young children to invest in a few Alpine strawberry plants (trust me, you’ll be glad you did), or extolling the many benefits of kiwi berry vines. They’re so much easier than annual vegetable gardening! For anyone who thinks gardening is drudgery or work, berries are your new best friend. Unlike lettuce and carrots and other annual crops, which require planting each spring and careful tending, berries are a one-time effort. There’s no need for daily watering either. Once established, you can generally get away with watering berries once a week (I haven’t watered my blueberries or raspberries in years, thanks to a thick mulch of wood chips and leaves). Yes, there is annual pruning to be done, but I’ll trade 30 minutes of effort each year for all the golden raspberries I can gobble. If you want to convert someone to backyard fruit growing, just let them taste a freshly picked berry at the peak of season — they are so far superior to the fruit you find in the grocery store, with a depth of flavor you may not have experienced (this is not an exaggeration: commercial growers select the varieties that stand up to transportation and look good on shelves, which are not necessarily the best tasting). The strawberries you grow will be sweet and red right through the core, the raspberries will be tangier, and the blueberries more flavorful than you would ever imagine. One taste will convince you; there’s really no comparison. A friend of mine swears the $12 she spent on a pot of Tulameen raspberry canes has given the best return of any financial investment she’s ever made. She now harvests so many berries each summer that she gives the surplus away to friends and family. After a few years of growing your own, you’ll scoff at the idea of paying $5 for a tiny basket of berries. For a similar amount, you could buy a strawberry plant, a bare root raspberry cane, or a tiny blueberry that will grow and reward you for years to come. Any food you raise in your backyard cuts down on the energy use and carbon emissions that commercial agriculture creates — much of that involved in transportation. And if you’re buying berries out of season, that fruit is coming from states (sometimes countries) far away. Growing your own will tie you to your local berry season — and often give a surplus you can transform into jam or tuck away in the freezer for winter treats (there are recipes in the book to help you with that). Our warming climate will thank your small effort. It may be odd to think of your garden as a legacy, but blueberry bushes can live 100 years. The berries you plant today will feed you for years to come, then provide a sweet surprise for whomever comes after — children, grandchildren, or lucky strangers. Few people ever complain about free, tasty fruit growing in the corner of the yard. Plant them for your own benefit, but feel good about paying that pleasure forward. 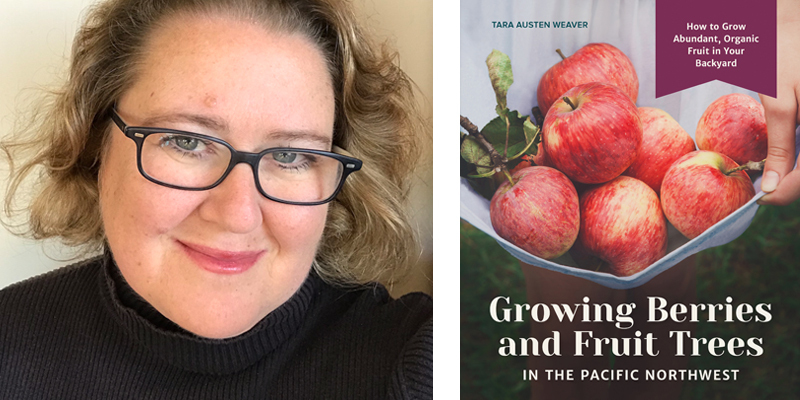 Tara Austen Weaver writes about the big, wide world: food, travel, culture, the environment, art, and adventure in its many guises. A Northern California native, she has lived in five countries on three continents and is happiest either exploring with a notebook and camera, or spending the day in a kitchen learning how people feed themselves (the best stories always get told in the kitchen). Growing Berries and Fruit Trees in the Pacific Northwest is her most recent book.